Here I am, watching the NBC coverage of the Olympic Men's Super Combined Alpine competition. The Americans are doing great, and we know Bode Miller wins the gold medal that until this point had eluded him. Hoo-ah for Bode! I remain sorely disappointed however; not one announcer or commentator has asked the question, "Did anyone get Ligety's splits?" No one has a sense of humor anymore. 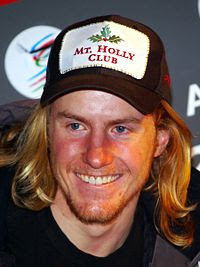 Photo of Ted Ligety courtesy of Wikipedia. 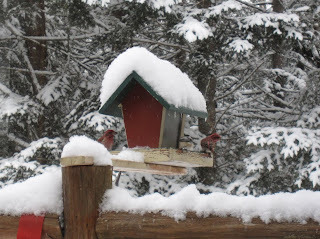 There is never a lack of entertainment or things to do during the winter in the Adirondacks. From an invigorating competition to relaxing in a cozy, warm house, you can have it all in the Adirondacks. Lake Placid and the region delivered the customary cold and snowy weekend for the thousands of Empire State Games athletes and their families in town for the event. It is interesting to note that most of the local athletes currently competing in the Vancouver Olympic Winter Games competed in the Empire State Games in their youth. The Empire State Games (ESG) are a great program. As producer of the first State Games competition held in the United States, New York's state game officials were considered progressive when in 1980, they developed a mini-Olympics for residents of New York State. The ESG have remained a popular 'feeder' program for young athletes and have provided fun competitive opportunities for adult athletes for thirty years. The combination of our local Olympic medalist's recent success and the ESG have the Village of Lake Placid electric with energy this weekend. Out here, on the outskirts of Lake Placid, the energy at the homestead is decidedly more mellow. I am not one of those competitive adult athletes this year. 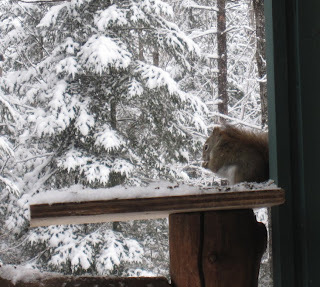 I am however, enjoying the sport of watching the snow fall, observing the morning's bird feeder activity, and a cup of tea. The fresh and fluffy new snow holds the promise of delightful, noncompetitive turns later today. As a matter of fact, the birds seem to be the only ones in a competitive mood today. The purple finches pictured were quite nasty to each other over breakfast. 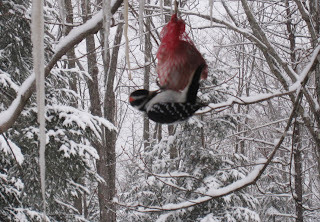 And certainly, no one messes with Mr. Hairy Woodpecker, shown pigging out on his suet lump this morning. It is the fellow shown below, the red squirrel, who is most annoying. He not only terrorizes my feathered friends, but he also has the nerve to come to the window and scold me to get going on the refills when he eats all the seed. A creature with bigger you-know-whats than his body, he will not leave until the resident biologist opens the door and shoos him off. The squirrel doesn't listen to me; clearly, red squirrel is among the language choices at wildlife biology school. All photographs courtesy of the Reed family.